I began using flower essences for myself about 8 years ago, and the results for me were amazing and profound. The freedom they gave me, to step let go of the negative thoughts and ideals that I held on to, and step fully into the person I always knew I could be, was just so incredibly freeing. Later on I found out that animals could benefit from them as well and the the results they had were sometimes instantaneous. So, I began taking classes, tele-seminars and eventually certification workshops. I began to prescribe them for my animal communication clients who were showing unwanted behaviors. 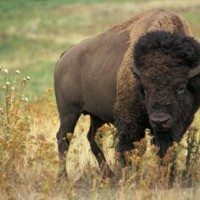 Being able to talk to the animals, gave me a unique opportunity to discover the REAL reasons for their behaviors, and giving me insights so that I wouldn’t have to guess which essences would work, but instead to KNOW. All names are changed) Some time ago a client contacted me regarding his new cat Sal (not his real name) Sal had a specific fear for young men, now normally, the essences to give for a situation like this is Mimulus. However, through communicating with Sal, he told me that the real reason that he was is frightened was because a young man had abused both him and the other kittens in the litter, and that all his other litter mates had died due to the abuse which he kept reliving every time he can in contact in younger men. From the information that Sal shared with me, I not only prescribed Mimulus (specific fears), but Star of Bethlehem (mourning and loss) and Honeysuckle (letting go of the past), and Sweet Chestnut (mental anguish) as well. Allowing Sal to fully release all of his past trauma and step fully into his life. His person contacted 3 days later to tell me that Sal was a “completely different cat, happier, more loving and completely at ease”. I continue prescribing the Bach Flowers for my animal clients, I lecture and teach tele-seminars, and workshops about the subject and, I really love them! Other “Spotlight” flower essence posts: So far, I’ve put the Spotlights on, Mimulus, Heather, Larch, Honeysuckle, and Five Flower Emergency Essence. In each I talked about how these essences help to bring about re-alignment, emotional re-balancing, and Well-Being to your animal friend(s). SO…What ARE Flower Essences? : Essentially the way they work are at a being’s vibrational and emotions levels. The essences are vibrating at a higher speed and more POSITIVE level, then that of the current negative behavior. When taken, the essence opens up the blockage(s) and similar to a turning fork that is struck and put in a glass of water, re-tunes the body to the more positive vibrational level. This is bringing BACK an animal’s natural feeling of Well-Being and thus positive emotions and behaviors with it. I have personally found that since an animal’s natural state is to be in a constant state of allowing and Well-Being and that they gravitate naturally towards nature and her healing power that results in animals are incredibly fast and can be very dramatic. Please remember! Flower Essences are wonderful tools. However they are NOT a substitute for veterinary care. ALWAYS consult your Veterinarian on any cases dealing with your pet’s health even if you just suspect there might be a problem! So, let’s continue looking at Flower Essences and put the spotlight on one of my favorite essences…Crab Apple! 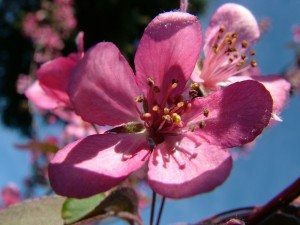 Crab Apple is the “Cleansing Flower”. This particular flower remedies unwanted behaviors associated with uncleanliness, need to over groom or pull out hair or feathers, as well as aiding in healing infections and toxicity. Positive outcome for your Pets:… This essences restores cleanliness and dignity to the animal, and or can help heal wounds & many types of skin erruptions. Below are some examples, which might help you to decide if Crab Apple is right for your animal friend(s). What are some common Crab Apple uses? To clean wounds: put 8-10 drops in bowl of water and wash the wound with the clean cloth dipped in the water SUPPORTIVE CARE ONLY IN CASE OF WOUNDS OR INJURIES PLEASE CONTACT YOUR VET. For animals who were caged or confined in with their own excrement. Animals taken out of hoarding situations. Supporting & helping the animal’s body cleanse itself of any form of toxicity or poisons that may have been consumed or exposed to such as antifreeze, or insecticides…AGAIN! SUPPORTIVE CARE ONLY! IN CASE OF POISONING PLEASE CONTACT YOUR VET IMMEDIATELY. For constipation, or UTI symptoms (to help them mentally with the unclean feelings associated with these issues. For obsessive grooming, pulling out of hair or feathers, obsessive, scratching or biting of the skin. For skin issues such as: mange, scabies, scale, eczema, dermatitis, dandruff, abscesses, licking of sores or acne & insect bits. For animals that eat the dung or other animals. Furballs (yes it helps the animals to expel them easier and faster). If there is a worry about infection, such as before and after surgery. For sheep & goats that suffer from scab. These are more examples, but these are only to name a few. HOWEVER and I STRESS this: These could be a signs of an even bigger physical problem! Consulting your veterinarian immediately is advised! How do I give flower essences to my animal friend(s)? Normally putting the drops in the animals water works very well, and if you have a multiple animal household, don’t worry, the essences will not do anything to the other animals, unless they need it. For small animals (cats, dogs): Give 2-3 drops in their water, from each bottle and then put new drops in whenever you change the water. For bigger animals (Horses, Cows, Llamas, etc) anywhere from 8-16 drops on a slice of bread, or muffins have been know to work too! Or take an apple, cut it either in halves or quarters, then use a knife of stick to make small holes into each slice and then put the essences into each of the holes. That should do the trick! If you do not notice even the SLIGHTEST of changes after a 24-72 hour period then it might mean your friend will need to try another essence. Do you still have questions about flower essences?… Do you have more questions or are you interested in scheduling a session for your pet? Simply leave your questions by replying to this post or send me an email by using the “Contact Coryelle” form. Coryelle Kramer is a naturally gifted seer, communicator and healer who has been connecting and speaking with animals, the Divine and spirits since she was a child. Enter your email to get all the latest blog updates from Coryelle delivered straight to your inbox. I’m currently using Bach remedies on myself, but noticed that one of my cats has become quite bullying towards the other one, so I think I’ll try the Vine remedy on him. He has also started to demand a lot more attention lately, and I’m not sure which one to try for that issue. I think I might just have a read through your e-book. Many thanks for the information. As you know the wonderful things about flower essences is you really can’t do anything wrong. If it’s not the right one the negative behavior wont’s stop, so you try another. 🙂 So try the Vine and see what happens. Welcome everyone, I'm Coryelle Kramer and I'm first and foremost here to help you, the animals and this planet through the work I do. Come in and discover how as a Seer; I can be a conduit to your guides, to the spirits, to divinity and to the animals. 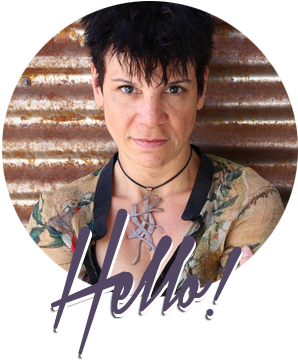 Here you will learn more about me, my spiritual work and psychic practices, as well as the many varieties of healing tools I use for animals and for people. Feel free to click on any of the boxes below as you are guided to. Thank you and enjoy your visit! Without you…my life wouldn’t be as rich or as lesson-filled. I’m listening more, being still more, honouring all things more (including myself, I hope!) and everything is wider and more. I’m even MORE grateful than before. Thank you so, so much. Want More Coryelle? Join Her Email List! Coryelle Kramer © 2016. Designed with love by RKA ink.